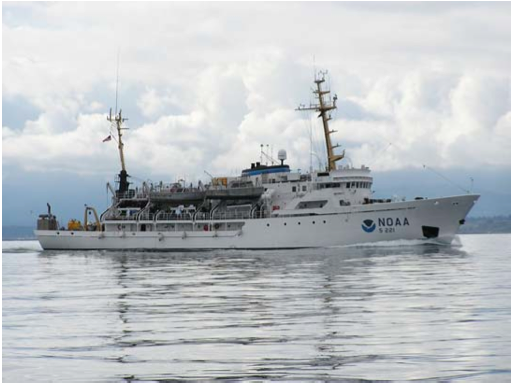 NOAA Ship RAINIER underway. Credit: NOAA. From this picture, I can see that the aft most launch ship has been launched for survey, for there are 3 launch boats on either side of the ship. I talked further with the crew today about interesting characteristics of this ship, including a “field trip” with Lt. Kevin Slover to inspect the hulls of the launch boats to see the echo sounding devices. I learned that there are actually 3 different types of these devices: one with low resolution for very deep water, one for a little higher resolution of deep water, and one with high resolution for shallower water. These devices cost up to $25,000! I was able to get pictures of the three types; however I am not able to download them onto the computer yet. Lt. Slover also showed me more of the Caris program, the most recent computer program used to collect and analyze the data. I say most recent used, because these programs are constantly being changed and updated to be more accurate, user-friendlier, and display better graphics. One of the most interesting features of this program is not only its accuracy, but also the ability to look at the computer created images of the ocean floor from any angle. One of the images pulled up as an example showed a shipwreck off of the coast of Seward in about 38 meters of water. The details of this sunken ship were almost crystal clear! Of course, this is after the data has been corrected and cleaned. I hope to work more with this program as we start the launches tomorrow and Saturday. A launch boat also left today at 08:00 to conduct further hydrographic research, and the RAINIER maintains her course, “mowing the lawn” in a section of uncharted waters between Kodiak and the Shumagin Islands. Once this area is completed, we will head to the Shumagin Islands to anchor and send more launch boats throughout the next week before we return to Kodiak. This is such an adventure! The foghorn blows every 2 minutes on this ship, and it acts as a great wake up call. This morning, the horn reminds me that we are sailing in a sea of uncharted and now seemingly invisible territory. I feel like an explorer thrown into the time of Captain Cook, half expecting to see a pirate ship emerge from the eerie blanket that surrounds us. However, the multitude of technology aboard this ship flaunts the modern times in which we live and, in doing so, destroys any hope of true exploration of the unknown. Still an explorer at heart, I also still find adventure in what we are doing. We are still conducting hydro research aboard the RAINIER, “mowing the lawn” across uncharted territory, so we are only moving at about 7 knots. A launch boat was also sent out today to investigate near by waters. As I sit here responding to emails and learning even more about how this ship works, I am anxious to see the data that is collected now be processed. Problem: Local fishermen travel the coastal waters along Alaska to make a living. However, these waters are poorly charted, if charted at all. As of now, fishermen use a “Hummingbird” device to measure the depth of water where they travel, but there is no electronic device that can record this data accurately, correct this data for margins of error, and combine this data to produce an accurate nautical chart aboard these fishing vessels. While boats such as the RAINIER have this capability, expanding the number of vessels capable of collecting and analyzing such data would expedite the nautical chart updating process. Proposed Solution: Design, test, and implement a device that abides by the following parameters: not very expensive, accurate, maintains the same abilities as the multibeam echo sounding devices aboard the RAINIER, has the capability of communicating with the computers aboard the RAINIER to share information collected, and can be mounted on the fishing vessels in such a way that it will not alter steering or speed. I asked Lt. Slover if there is much government funding for such engineering projects, and he assured me there is—most of the U.S.’s imported goods arrive by ship, so more accurate and up to date nautical charts are a large priority. This entry was posted in 2004, Leyf Peirce, NOAA Teacher at Sea and tagged bridge tour, hydrography, launch vessels, multibeam echo sounding, noaa ship rainier. Bookmark the permalink.